So, I was wrong about the cat, upon closer inspection the she turned out to be a he…but what a sweet, sweet cat. If you know who owns him, he is at the Big Bear Animal Shelter. GG doesn’t have the stomach to have another pet in town injured or eaten by the mountain lion whose pug marks (foot prints) were found just a few doors down from the party perch. I happen to be one of the few folks around here who has not seen the cougar yet. 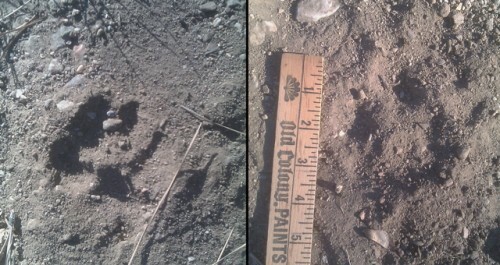 I often look for animal tracks and my neighbor was good enough to email me his find near the juncture of Lodge and Brookside. There have been a number of sightings of this cat above Brookside past Cedar Dell up the animal trail and near the capped spring. Yes, the lion and the bear like that area. But this year this cat has been active on Cedar Dell crossing over Brookside, meandering down Chickasaw toward the lake, down Mohwak near the juncture where it splits off to Navajo, and then over on Grout Creek. As always, GG is telling you to use caution at dawn and dust. Personally, I am not hiking around after dark as I once did. My first theory is that it is a young, inexperienced cat going for the easy prey but my ol’ pal from animal control suspects that it is a sick, old or injured lion–and she might be right. Do GG a favor, if you have sighted the mountain lion or witnessed an animal attack, take a minute to leave a comment and the location, plus a time frame of when it happened. In case you missed some of the previous resources I used to post, they are all in the archives but here is a quick refresher. I have not checked them recently so if you have any corrections, let us know in the comments. Just a reminder that Highway 330 is undergoing some roadwork from 10:00pm until 5:00am until October 16, 2013. Nice that they are finally doing some work at night instead of peak hours. The monthly gathering will take place Monday, October 14, 2013 starting at 5:30pm for the social or dinner at 6:00pm. The NSIA potluck will take place at the Old Miller Park School House located at 1178 Chickasaw Lane in Fawnskin. Bring your favorite dish and join an evening of good food, meet interesting neighbors and enjoy engaging conversations. Fawnskin home owners and residents are invited so head on over for some food and fun. GG is SO happy to announce that Royal Thai will open this Friday. They are located at 40766 Village Drive in Big Bear Lake. Phone is (909) 866-2806. Located in the old Trolls location on Village Drive (you may remember the location as Desi’s or Cafe Mambo’s). GG is expecting big things since it is being opened by our wonderful cuisine providing folks at the Himalayan restaurant. If you head over on opening day, you can get a 20% discount so be sure to “like” the Royal Thai Facebook page so you don’t miss a thing. This entry was posted on Tuesday, October 8th, 2013 and is filed under Business & Commerce, Mountain Wildlife, Talk of the Town.